This exercise is in two parts. 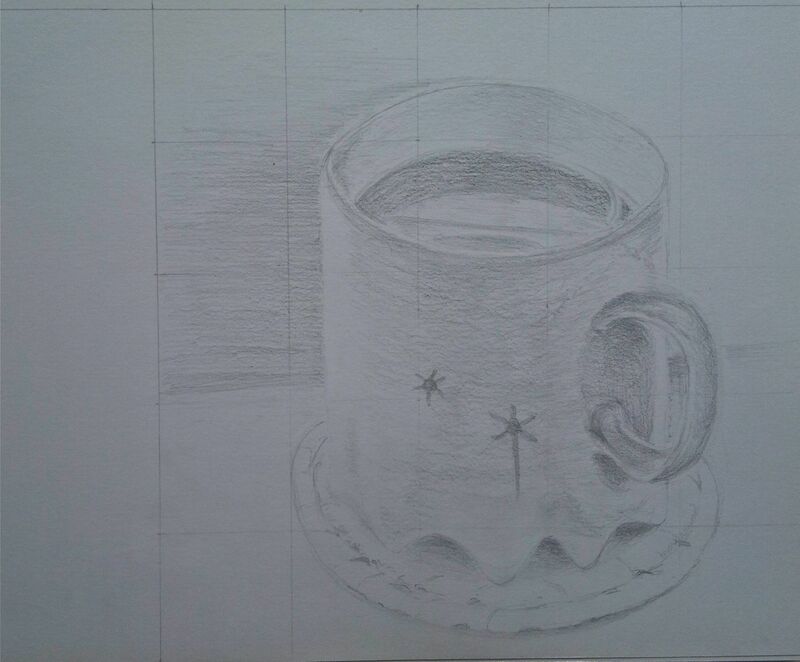 The first part used a simple 5 x 5 grid and a single object, a mug. 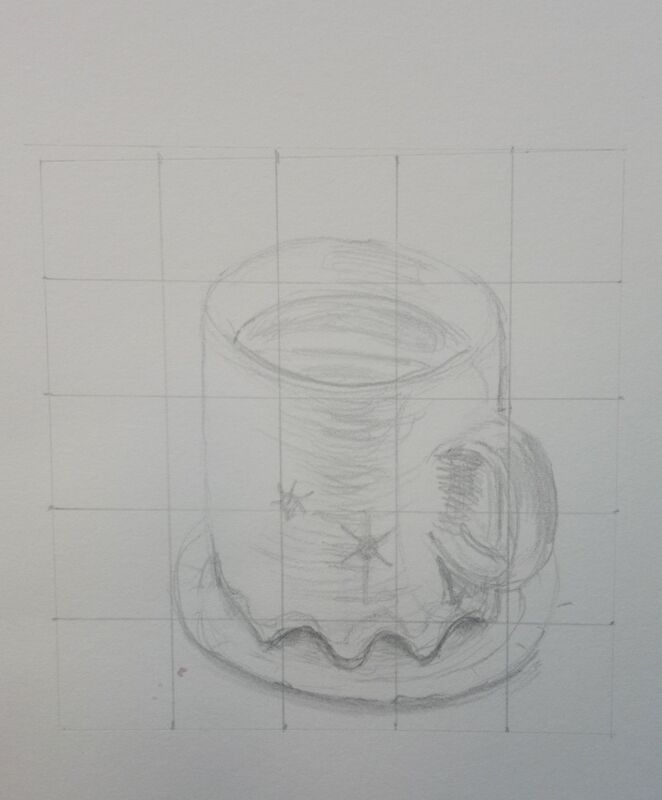 The mug has an uneven base for more tonal variation. Transferring the image to the larger scale grid forced me to look again at the angles that the object makes with the negative space at different points. A ruler can be used to check that lines crossing grid lines are accurate. This makes one more aware of “invisible verticals”, for example, where the handle joins the mug. Having enlarged the image, I then developed the drawing. Frottage was not used as such but gently rubbing the surface of the paper (Hahnemühle, 140 gsm) brings out the grain and can achieve a frottage-like effect. 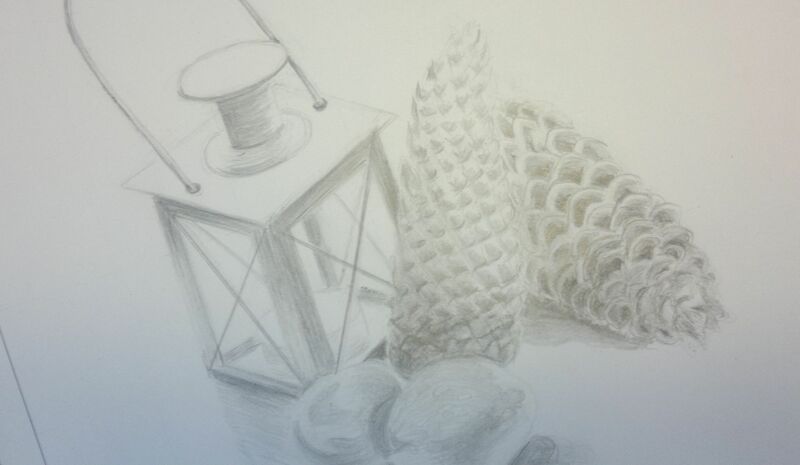 The second part of this exercise involves several objects in a still life, similarly enlarged in the final drawing. These follow on the next page…. 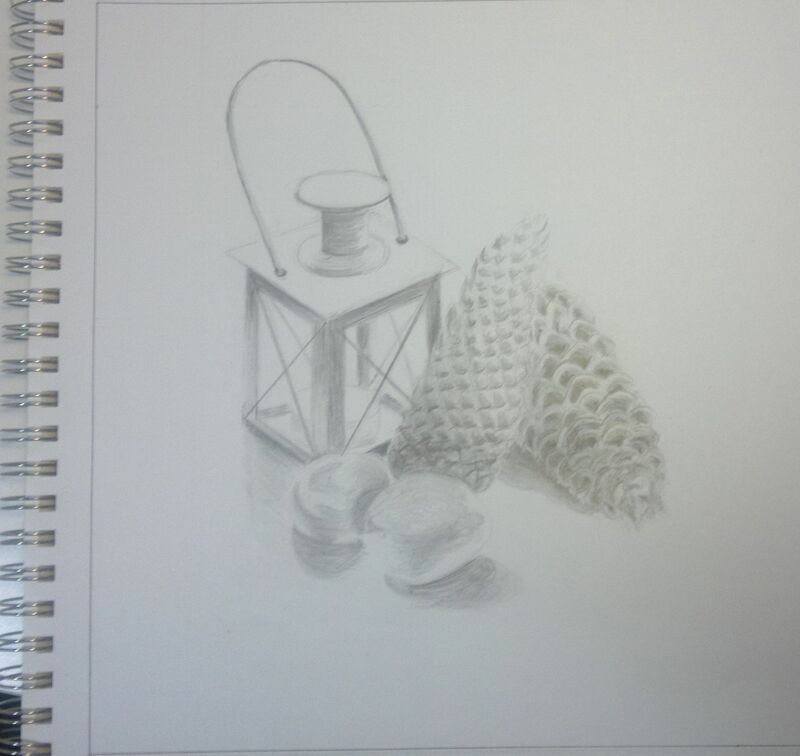 The same technique was applied to a group of objects (a lantern, fircone and pebbles). An 8 x 8 grid of 2 cm squares was drawn using a black fineliner pen in the sketch book and enlarged four-fold on A3. 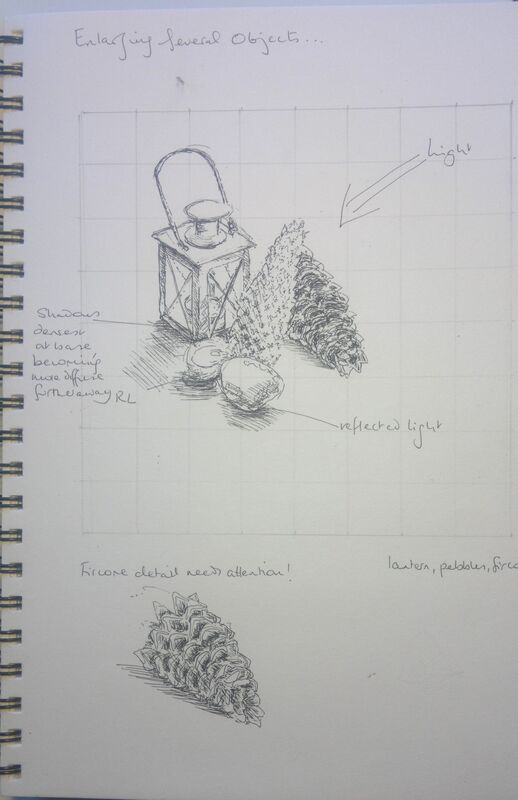 The fircone was a challenge and I practised drawing it before attempting the final drawing. Initially, the drawing – in graphite – was scaled up directly from the grid and then details were drawn directly from the still life arrangement. Small adjustments to some angles were made, particularly for the lantern. The light changed considerably – the afternoon darkened with rain and I put a lamp on which created very different lighting conditions from the original sketch. Reflected light was most evident on the pebbles. The scaling up process is fairly straightforward and a useful way to draw objects larger than life-size which otherwise feels counterintuitive. Drawing large objects smaller than life-size is OK but the other way around seems odd (to me). In Robert Kaupelis’ book “Experimental Drawing”, he shows how a distorted grid can produce interesting drawings. Some of Ben Mahmoud’s early drawing used distorted grids. Examples of these can be seen as drawings or works in acrylic on the website that is still maintained by his son, Jeremy Knopow. Scroll down to the list of contents and click on “Older Works”. The link here shows how a distorted grid can be applied.